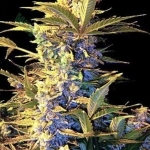 This is a stabilised cross between a Lowryder #2 and an automatic AK47 in which the two parents strongly exhibit their best genetic traits: high resin production, the fruity aroma (of a carefully selected Lowryder #2 phenotype), and the size and branching of the AK47 automatic. This poly-hybrid is fully auto-flowering and matures in 70-75 days from germination, reaching optimal size if given enough light (intensity and time). The best conditions are 20 hours of light and 4 of dark during the entire cycle. Outdoors the best time is may-august, but it's easy to do multiple cycles per season, until November.